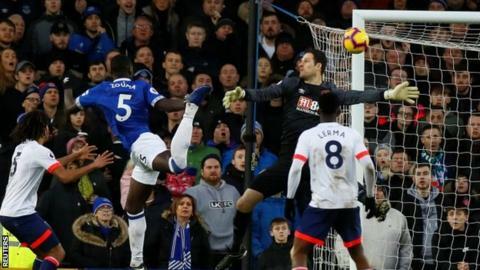 Kurt Zouma powerfully headed in his first goal for the club from Lucas Digne's cross following a corner in the 61st minute, before Dominic Calvert-Lewin added the second in the fifth minute of stoppage time. Everton had been outplayed in the opening 30 minutes but Bournemouth failed to capitalise on their bright start. David Brooks hit the post when through one-on-one with goalkeeper Jordan Pickford and had a strong penalty appeal turned down early on, while Joshua King also had a good chance saved. Everton, who had not won any of their previous four home league matches, failed to have a first-half shot on target for the second successive league game at Goodison Park. They improved after the break, with Richarlison having a shot cleared off the line by Nathan Ake and coming close with a header from Gylfi Sigurdsson's cross. Everton's win in the FA Cup against Lincoln last week was just their second in their past nine games. When asked about any pressure that form had put on his team, manager Marco Silva admitted his side must improve in the second half of the season. Any murmurings of discontent among fans will not have been eased by his side's start. Everton struggled to create any real momentum in attack and were edgy in passing the ball out from the back. They were better from the closing stages of the first half with Ademola Lookman lively as he made just his second league start of the season. Bournemouth struggled to maintain their performance of the opening 30 minutes but their late pressure resulted in mounting tension around Goodison. The crucial block from Keane and strong defending at corners helped Everton keep a first clean sheet for two months. At full-time, the relief was evident both in the dug-out and the stands. The Everton fans had seen their side lose to Leicester and Tottenham and draw with Watford and Newcastle during their winless home run but this time they held on and are now within three points of seventh-placed Watford. They are a place lower in the table lower than at this stage last season, when Sam Allardyce was manager, but are three points better off. Bournemouth were without Callum Wilson for the trip because of injury - and for all of their good attacking play early on, they missed their top scorer's clinical finishing. Brooks never managed to fully get the ball out from under his feet before striking the post and King scuffed his ninth-minute close-range shot a little, giving Pickford the chance to save. Had England international Wilson, who has 10 goals this season, been the one attempting to convert those chances then the Cherries may have had earned reward for their strong start. Bournemouth could also count themselves unfortunate with some of the refereeing decisions, with Brooks denied a penalty early on. The Wales international went down under a challenge from Idrissa Gueye in the 11th minute and the Everton midfielder did not make any contact with the ball. They also had a less convincing first-half penalty appeal turned down when Digne blocked Ryan Fraser's cross with his arm, and another when Andre Gomes hauled over Jefferson Lerma off the ball in the 90th minute. Manager Eddie Howe praised his side's performance after the game but they have now lost seven of their past nine matches in all competitions. Of further worry is the fact that after winning three of their first five away games this season, Bournemouth have now lost their past six. Everton manager Marco Silva said: "They were an important three points for us. We knew before the match it was important to turn the last few results back our way. Bournemouth manager Eddie Howe said: "I thought we played well today, we started the game well and we had a good chance with David Brooks but that's how it is going for us. A lot of elements were really strong but ultimately it goes against us. Bournemouth have conceded 103 goals in the Premier League since the start of 2017-18, two more than any other team in that period (West Ham are closest on 100). Everton's Lucas Digne has had six goal involvements this season (three goals, three assists), equalling his best ever tally in a top-flight campaign (six for Roma in 2015-16). Dominic Calvert-Lewin scored his fourth Premier League goal of the season for Everton, equalling his best-ever tally in a top-flight league campaign (four in 2017-18). After scoring six goals in his first nine Premier League appearances for Everton, Richarlison has scored just three goals in his past 11 games in the competition. Everton will look to extend their winning run to three games when they travel to play Southampton on Saturday, 19 January (15:00 GMT). Bournemouth host West Ham on the same day (also 15:00 GMT) as they look to return to winning ways. Attempt blocked. Dan Gosling (Bournemouth) right footed shot from the centre of the box is blocked. Assisted by Lys Mousset with a through ball.